College standout. CJHL Player of the Year. NHL winger. Record holder. Author. The 25-year-old Hyman, who hails from Toronto and plays for his hometown team, happens to be all those things. Author? He most definitely is. Drafted in by the Florida Panthers 123rd overall in 2010, Hyman has already penned two books with another due out in 2018. His first work, The Bambino and Me, was published when he was in high school. It tells the story of George, a young New Yankees fan, who worships legendary baseball star Babe Ruth, and carries his baseball card with him everywhere. Hockey Hero, released in October of 2015, is about a shy hockey player who steps out of his brother's shadow to make his own dream become a reality. Hyman’s third work, The Magician’s Secret, will be available in April. It’s his first non-sports project, a story of a grandfather and grandson who celebrate the power of imagination and the magic of make believe. Being an author has enabled Hyman to do just that – share his love of books and reading with schoolchildren in the Toronto area. In June, he visited Southfields Village Public School after the school won the Play Your Part Challenge through the nonprofit organization, Right to Play (a worldwide organization committed to improving the lives of children and youth affected by conflict, disease and poverty through play). He met with the kids and read The Bambino and Me. Those interactions always prompt Hyman to recall his own childhood experiences with reading. Inspiration for his writing isn’t hard to come by. And if he was to write a lighthearted book about one of his Maple Leafs teammates, Hyman has one particular player in mind. 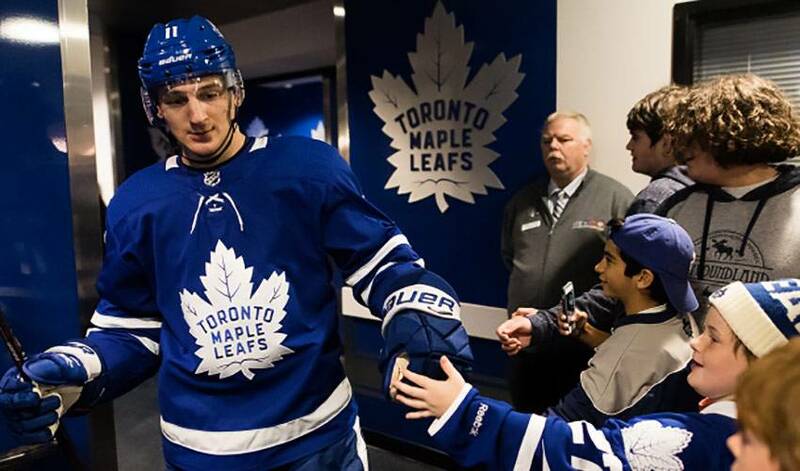 When it comes to one of his biggest passions away from the rink, Toronto forward Zach Hyman does it by the book, so to speak.